When my dogs Missy & Buzz came into my life at just 8 weeks of age, I immediately started working on basic obedience commands with them. I wanted my dogs to be as well behaved as possible right from the get-go. The pups learned how to sit, lie down, stay and leave things they weren’t supposed to be chewing within the first few months. 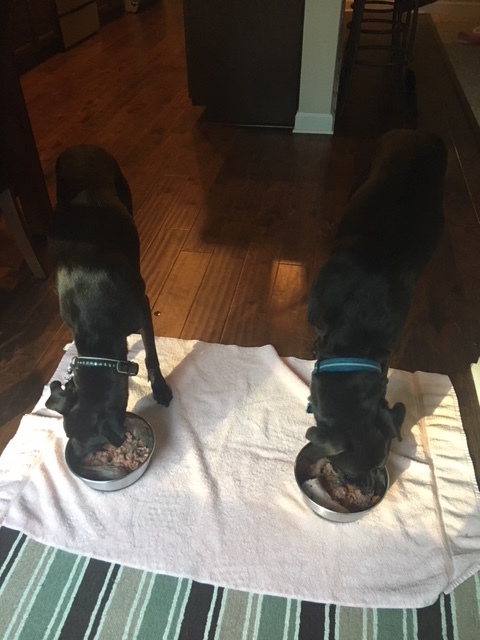 Most importantly, since we incorporated those commands around their mealtimes, they got to associate polite behavior with the reward of being fed. I had seen some videos of super unruly dogs who went bonkers whenever their food was being dished out. I was determined not to allow that kind of behavior with my guys. Back then, they were on a kibble and wet food diet. Now that their diet consists of raw meat, it’s a lot more enticing than dry dog food. I’m extra thankful for well behaved pups whenever I get ready to pull their meals from the fridge. 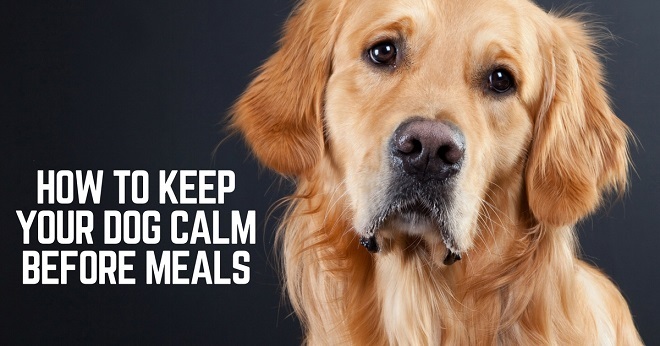 Here are some ideas on how to keep your dog calm before meals. I taught the pups the 3 following commands with training treats. I’d either use small store-bought treats, pieces of cut up hot dog or string cheese. I personally didn’t use a clicker, but I know of several people who’ve successfully used that method. It’s a matter of personal preference. a) I’d either lure the pups into the position I’d want them in with a treat and then once their butts hit the ground (for the “sit”) or they were lying down on the floor I’d add the command in a firm, calm voice and give them the treat. b) The other approach I used was to simply take advantage of whenever the pups happened to sit or lie down on their own. All I had to do at that point was to dish out a treat and say the command. Of course, that meant that I’d be walking around our apartment with my treat pouch clipped to my clothes, sometimes for hours at a time. But I was determined to use their natural behavior in my favor as much as I could, and it worked out quite nicely! I’ll put the pups into a “sit” or a “down” position right before I start putting their raw meals together. They will typically sit or lie down at the threshold between the living room and the kitchen and wait patiently for my release for them to go eat. I’ll admit that every now and then they do break their “stay” position and tiptoe into the kitchen while I’m still preparing their food. This usually happens when I’m pulling something extra delicious out of the fridge, like green tripe for example…that stuff IS extra smelly and super enticing. I don’t make a big deal out of it whenever it happens. I will correct them by putting them back into their previous positions and remind them what I expect with another “stay” command in my “I mean business” voice. Note that this doesn’t mean that I start yelling the command, I just say it extra firmly. The release command allows the pups to break from whichever position they were in. I taught it by moving away from the pups while they’re still in a “sit” or a “down,” and switching from the firm voice to an excited, happy, upbeat voice. As soon as they moved, I’d say “ok puppies!” and reward them with a treat. You can use whichever command you want your dogs to associate their release cue with. It doesn’t have to be “ok”, but could be anything like “go” or “enough” or “bananas” if that’s what you wanted to use. Some dog trainers prefer not to use the word “ok” for release purposes because it’s used so much in our language. Some dogs get confused about when it’s meant for them. 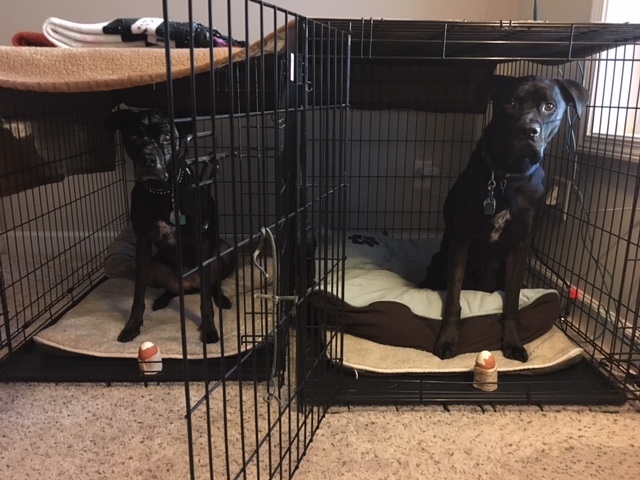 I personally didn’t find out about this training secret until after I had already taught the pups our “ok” release, so I didn’t end up retraining them. 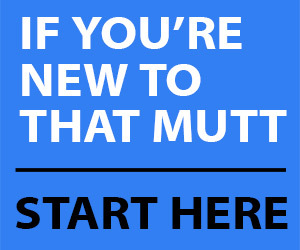 So far, it has worked out nicely for us – maybe because I use it along with the word “puppies” right after. 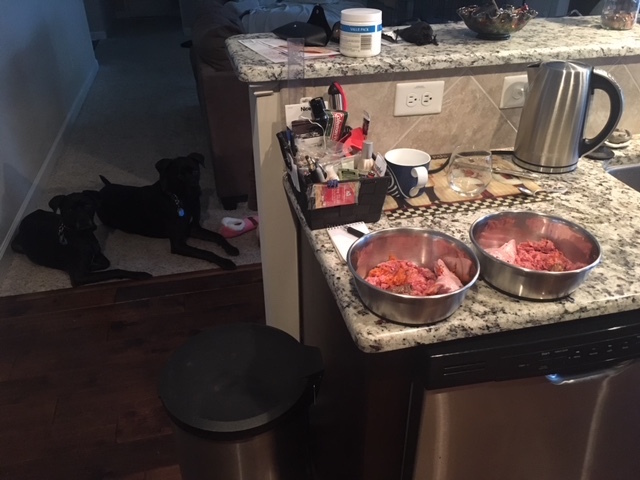 Once I’ve prepared their meals, carried them over into the area of the kitchen where the pups eat, and placed them on the floor, I wait a few seconds and then say “Ok, puppies, go eat” in my happy voice. As soon as I’ve released them, they can’t get to their respective bowls fast enough to devour their raw meals. That’s their very own pot of gold at the end of our patience game! I’d let the pups play with a toy and then offer them a high value treat like cut up hot dog that would entice them to drop the toy. As soon as they dropped it, I’d say “Leave it” and reward them with the treat. I use the ”leave it” command on those days when I get our shipment of different raw food cuts from Raw Feeding Miami and am busy cutting up meat and filling food storage containers. I’m a bit on the clumsy side and will inevitably drop some of whatever I’m cutting up. Whenever that happens, the “leave it” comes in super handy and both pups are really good about respecting it. I also use the “leave it” command when the pups get ready to dig into a special treat in their crates. I’ll ask them to sit or lie down, then I’ll place the treat in front of them while asking them to “leave it.” It’s a good way of practicing our polite doggie skills. The picture below shows the pups “leaving” their beef trachea/boiled egg treat that I put together for them. The keys to dog training are consistency, patience and ending on a positive note. Whenever I attempted to practice with the pups when I was cranky or frustrated, it was bound to lead to a frustrating training session. The pups would pick up on my crankiness and be testy themselves. So if you don’t feel up to it, go scream in the closet and/or wait for that mood to pass before you attempt any training. Believe me, I’ve been there a few times! That being said, training sessions don’t have to be super long – a few short ones throughout the day will do just fine, even if they only last for 3-5 minutes. I found that training the basics works best after having exercised the pups. That way, they got rid of any pent-up energy and were able to better focus on what I asked of them. That’s why I would always start our daily routine with a 30-60 minute (backpack) morning walk, followed by preparing their breakfast once back inside. The pups would almost always lie down on their own because they were pooped from our walk, at which point I’d give the verbal command. I’m all for working smarter, not harder. One last piece of advice is to make sure everyone who interacts with the dogs is on the same page as far as training is concerned. I made sure that whoever fed Missy and Buzz was familiar with our feeding routine. That included my husband as well as our occasional pet sitter or friend who happened to be watching the pups. Have you taught your dogs any commands that come in handy when feeding them? 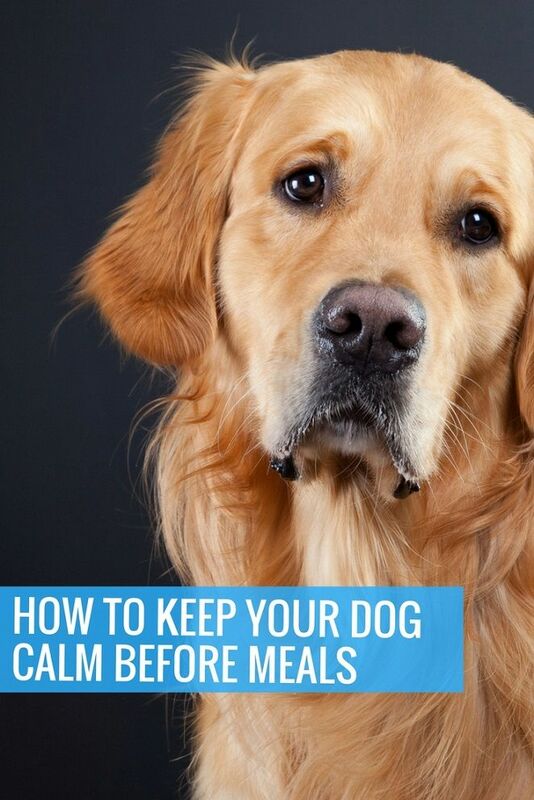 Please share this post with anyone who might need some help training their dog to be calm before meals. What good puppies! These are very useful routines and commands that are beneficial in a number of situations. We use “okay” a lot as well, including as our “go eat now.” Weirdly, my husband has also developed a “mangey, mangey” command (based on the French word “manger” or “to eat”… our accent is intentionally terrible). Ha, I love the French approach to the eating command 😉 That’s a refreshingly unique one! I use “ok” for Ace and “break” for Remy. Remy is really excited when I get his food ready. I put him in a down/stay or in his kennel with the door open and “stay.” If I don’t tell him that, he will run around and aggressively tumble with my other pets. Like kind of playing but could easily turn into a real fight. He’s really naughty! But a firm down/stay manages this. Dinner time is chaos otherwise. That’s smart to use two different release commands for your pups. Thankfully my dogs don’t get mad excited when I give them their food (I must give them very boring food :)). I do have issue with pure excitement when going for a walk though. I have tried waiting until they calm but the moment I take a step closer to the door, hyper levels are at 100 again. Plus I have two dogs so they encourage eachother. We have jumping, whining, pulling at the door and if I drive to the park, its pure whining the entire time. Would love if anyone has any suggestions to calm them….especially in the car as I cant have people in the car with me with the dogs because I am mortified! You could try securing them with a car harness that attaches to the seat belt, that way they’re at least “forced” to stay somewhat in place. 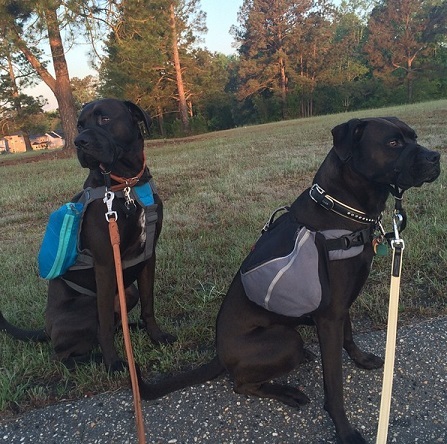 I really like the Ruffwear harnesses. Maybe play some calming music while you’re in the car and see about getting some energy out of your guys before going for a car ride. If you have a fenced in back yard, you could play a game of fetch with them, or challenge them mentally by playing a game of “come find me” inside your home.